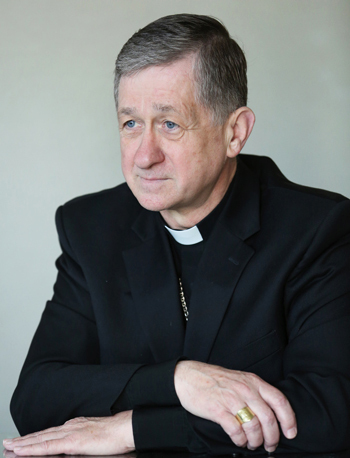 WASHINGTON (CNS) — The U.S. bishops’ Committee on Ecumenical and Interreligious Affairs announced Feb. 8 that it is launching a new National Catholic-Muslim Dialogue, and Chicago Archbishop Blase J. Cupich has been named its first Catholic co-chairman. “As the national conversation around Islam grows increasingly fraught, coarse and driven by fear and often willful misinformation, the Catholic Church must help to model real dialogue and goodwill,” said Bishop Mitchell T. Rozanski of Springfield, Massachusetts, who is chairman of the committee. For over two decades, the U.S. Conference of Catholic Bishops’ ecumenical and interreligious committee has co-sponsored three regional Catholic-Muslim dialogues, and Bishop Rozanski said the time is right to begin a national dialogue. “Our current dialogues have advanced the goals of greater understanding, mutual esteem and collaboration between Muslims and Catholics, and the members have established lasting ties of friendship and a deep sense of trust,” he said in a statement. He also thanked Archbishop Cupich for agreeing to represent the USCCB “in this crucial conversation.” The Chicago prelate’s tenure as dialogue co-chair will begin Jan. 1, 2017. — The mid-Atlantic dialogue, which partners with the Islamic Circle of North America. — The Midwest, which partners with the Islamic Society of North America. — The West Coast, which partners with the Islamic Shura Council of Southern California and the Islamic Educational Center of Orange County, California. Each is co-chaired by a bishop and a Muslim leader from the corresponding regional organization. The release noted that establishment of a new Catholic-Muslim dialogue follows a 2014 statement from the ecumenical and interreligious committee stating that the Catholic Church remained committed to dialogue with leaders of other religions and Muslims in particular. It said the church’s mandate to engage in dialogue with Muslims comes from “Nostra Aetate,” the Second Vatican Council’s Declaration on the Relationship of the Church to Non-Christian Religions. “Sadly, in recent years, there has been a deliberate rejection of this call to engage in dialogue with our Muslim brothers and sisters by some in the Catholic Church and in other ecclesial families,” the 2014 statement said. “We understand the confusion and deep emotions stirred by real and apparent acts of aggression and discrimination by certain Muslims against non-Muslims, often against Christians abroad. I have attended a couple of these dialogues and I must say both parties are well aware of each others religious doctrines and have found that they share more common interests and beliefs that they can work together on. Furthermore these dialogues have gone a long way in bringing both our communities together in America. This does not mean that suddenly middle eastern Muslims or African Christians will stop killing the other because a group of their co-coreligionists are meeting in America. Even expecting such an outcome is clearly a desire for such interactions to fail and exposes not-so-hidden racism. Will this “dialogue” stop the killing of Christians, and the destruction of churches and monasteries, in the Middle East? Before He ascended into Heaven, did Jesus order us to “dialogue”, or to teach his commands?! Does any member of this “dialogue” know the meaning of the following words: Jazira, Taquira, Abrogation, Dhimmitude, Dar Islam, Sharia ?